That was me about an hour ago. I am wearing SHORTS, people. In a really hot sunpatch on the porch. In March. I am not prepared for this, at all. By which I mean, of course, that all my socks are suddenly way too hot to wear. This is an issue because for reasons I still feel way too young to understand, I pretty much have to have orthotics most of the time I'm walking, and while I do have sandals with excellent arch support (thank you Mephisto) the sandals I can actually run in, which is often necessary because I am often late, do not. I wonder whether there's a connection between the need for orthotics and the chronic running to catch up? Anyhoo: it's time for emergency knitting of the 'sockette' variety. I had intended to use the much-loved-by-me Turkish Bed Socks pattern for this job, but when it came the point I just felt their construction was less than ideal for my Mary Janes, and also, I can't get gauge with anything lighter than sport weight which is just So Much Too Hot. That picture up there? That's after two days of knitting, so you now have an idea of how all the whole 'design it myself' thing is going. I haven't even hit the part where I get to work in the round, yet. GAH. Doesn't it look like a bouquet? Aren't the colours gorgeous together? I'm afraid to touch it though. It took me two hours to get myself back to the point where I hadn't made any errors, and I want to be alone on a little unlimited-time island when I start back into it. Not sure when that's gonna happen. Maybe after supper. I don't drink coffee, so I don't think I actually slept last night, and I'm still sort of buzzing around the house today. But: so worth it. ... he said Something Different yesterday. He said he thinks it's time for me to follow my many and varied non-knitting experiences over this long period of Huggingness into some other writing endeavors, and that was even before I told him I was floundering about the direction my writing is taking, or rather, the lack thereof. I know the free patterns are a huge big deal for the crafty people who drop in here; I know the technique posts and pattern shop are also appealing. But what else would you like to see? Interviews with other knitters and writers? Less posts from me and more patterns, the result of my knitting more than I'm writing about it? Less spinning? More skilled spinning? Other types of crafts, like sewing, gift tag/card printables, or - oh, I don't know, papier mache? Do tell, my friends. You can comment here if you like, or message me at Ravelry, or e-mail me directly. I would love to know what you think! You definitely need another camera. The pictures here are clear, informative, and some are beautiful, but I can sense your deep need for another camera! As for writing topics, I think I like reading about YOUR thoughts, opinions, and experiences in the fiber world. Oh, I love free patterns and collect them madly as if I'm going to make them all, yes I'm a hoarder, but it's the words you wrap around the pattern, and your tales about socks, and your descriptions of lace knitting that keep your blog in my rss reader. Wayson has guided you well. Mary, I really enjoy your blog. Ditto what the first person said, and ditto what the second person said. I guess what I really appreciate about your blog is the inspiration it gives me to carve out that "zen" factor in my life each day. The hints about buying a prepared chicken and laying out a few days' worth of clothes in order to have a few quiet moments to knit in the morning are incentive to me to do likewise. 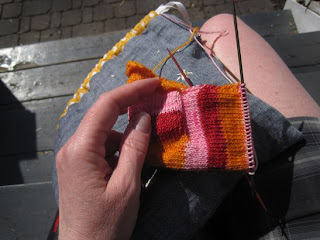 Your sock posts just about havie me feeling obsessive about my joy (and frustration) with sock knitting. So, to make this long comment short, keep it up! Your blog is one of my favorites. You write it from the heart and your creations are fantastic. You've kept my interest, don't worry about change. Thank you for all your effort you put into this blog and your patterns. Aw, thanks guys - this really puts my mind at ease. I was worrying I'd need to either work harder at this or work less, but if it's really about the writing and the carrying on as before, I'm good to go! I'm late to the party, but had to chime in that I agree that your writing is what keeps me coming back day after day. 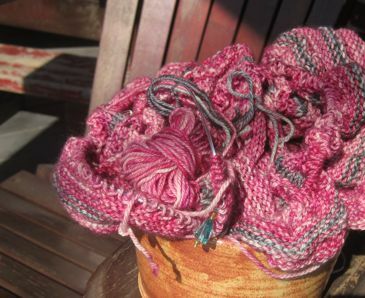 You have a unique way of putting together thoughts on the world and knitting. Whether I'm happy or sad or anything in between I know I can pop over here and find something reliable to feed my mind. The patterns and photos are just bonus. You and your take on life, presented with your amazing flare for the written word are the gift.